I have been trying to put into words how I felt after going to church I mean, “When Pens Collide.” But that’s exactly how I felt when I left the event experience. I wanted to tap three of my neighbors next to me on the train and say, “Neighbor, let me tell you how good When Pens Collide was for my soul.” I want to shout to the world (to every woman of color) that even if you have never considered writing that you should come for the good word that is, When Pens Collide. There was God in the aisles, singing in the pews, and the tambourine of hearts all beating the same “Black Girl Magic” beat at once. It was love. “When Pens Collide,” was just an idea, a really really cool idea but it was a simple idea to bring writers together in a safe space to listen to their words. What would happen if you took some of the baddest writers on the internet put them in a room and allowed them to read each others work ? What would happen if they got to consume their work the same way the readers who have supported them for years have done? What would happen if we got the chance to ask the person behind the pen a few questions? What would happen if we added wine…lots and lots of wine? Would it work? Would these writers be courageous enough to allow a collision that might leave them in tears? Would they believe that if we took them to the edge we wouldn’t push them over? 9 is a magic number…because I said so. Is your pen good enough? I read and I read this time for bread crumbs. It was through them that I found my audacity, it never left me, I just mentally blocked it. I created a whole new set of questions and I knew they were good. I wrote the letters and while I was unsure if it should be my words taking the stage first…I kinda just jumped. What #BlackGirlMagic looks like on an ordinary day. On Saturday November 21, 2015 I got to experience something I can barely put into words. People hash tag it #BlackGirlMagic but even that’s not enough. The stage was set, “The Draper Space” would be the safe house for the “Magic 9,” and supporters of their work to come and participate in something so magical that even social media wasn’t invited for the entire experience. When I entered the art gallery I was slightly anxious and filled with anxiety. While I have hosted endless events I am always very very nervous to take the stage of any kind. It can be an audience of two people and I will still tremble for the first five minutes. As soon as I entered I saw her, it was Shefon!!! OMG! I wanted to speak to her because I had to tell her that I read her work and I asked myself all those questions she wrote about. Before I could even compose myself I blinked twice and saw Ashley! She wrote “All That Jazz,” one of my absolute favorite pieces. I made my way to Tassika a safe member in the “Magic 9” because I had known her the longest. She smiled and nicely said, “you look like you need a moment.” She was right I needed at least 6-7 minutes to take it all in, I spotted Tamika, Yetti, Tyece, Reconia, Lissa-Marie, and my dope gal pal Erica (with two kids..insider). While everyone was enjoying themselves I couldn’t stop staring lol, they were all here, all nine of them. I had prayed the night before for their safe travels because they all didn’t reside in New York City. I was called “The Stage” and rightfully so, it would be me physically hosting the experience. I tried to envision what could possibly happen, but nothing prepared me for the actual experience. There was God in the aisles, singing in the pews, and the tambourine of hearts all beating the same “Black Girl Magic” tune at once! The panel discussion opened the eyes of the readers and the writers allowed us in to see them. We got a better understanding of who they were behind the pen, they laugh, listen to Beyonce, and want a closet full of furs, they are human. And then one after another the pens collided, some were hard like waves crashing into each other, while others were a little more subtle. Each writer got to experience their work the best way possible…from another writers mouth. The reader had a chair and the writer had a chair, sitting face to face you saw the writers revisiting places that touched their heart or made them cringe. We listened and watched as they allowed us in, we didn’t watch quietly because we were right there alongside of them. We cheered them on, we cried with them, and we watched as they grew in those moments, it was beautiful. The room was a healing, judgement free, girl I got ya back space. It felt like sitting in your living room with your bestie while drinking wine and letting your hair down. We got to be us…the good, the bad, and the great. I felt safe to be me and everything that comes along with that. I felt inspired, uplifted, and most of all I felt sisterhood. “When Pens Collide,” was the blessing I needed, it was confirmation that there is magic in all of us. 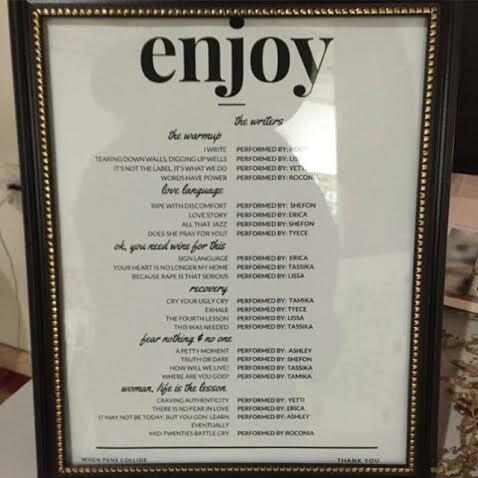 Special S/O to the writers…y’all know I stan for y’all hard lol. Ashley: (The Sunshine) You are truly amazing, I swear I am coming to Philly just so we can laugh…you catch the jokes lol! Lissa-Marie: (The Journal) You are honest, talented, and hilarious. Keep writing, I literally stood up out my seat when your words were read. Tyece: (The Grit) Chile you are the twice blessed writer, your words are needed always. Roconia: (The Revolution) <– will never be televised it will be written and you will be the author. Thank you for speaking on behalf of all of us. Yetti: (The Glass of Wine) You gave me courage to tell my own truth even if I laughed while saying it. I didn’t stutter or say “I’m just joking,” I stood in it. Thank you. Tamika: (The Alter) You are so real! When I was looking for someone to understand what I was going through I read your blog. Thank you. 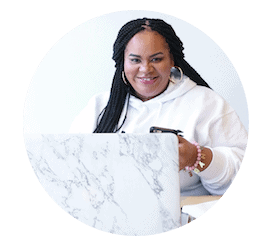 Erica: (The Curator Of Souls) You are the dope cool kid who everyone wants to hang with. You are yourself always and I love it! Shefon: (The Ballet) Number one, can I borrow your reading voice? Number two, when we going shopping? These furs aren’t gonna buy themselves. I read your work, and I made a list, thank you. Tassika: (The Soundtrack) You lend your light to others so they can find their way out of darkness. Thank you. And because I love quotes! 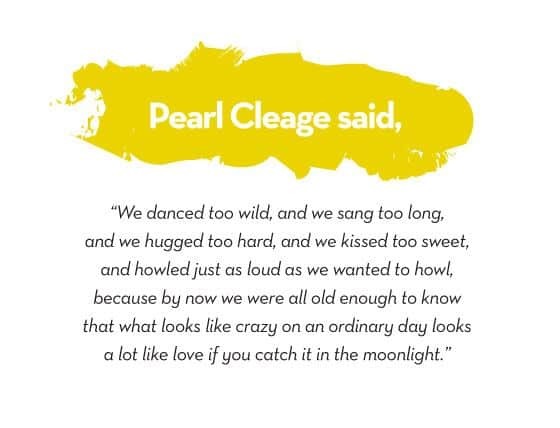 The perfect quote to describe “When Pens Collide,” would have to be from the lady herself…Pearl Cleage.